A Texas A&M International University (TAMIU) student recently received an award for his remarkable performance at the 19th Eugene Scassa Model Organization of American States (ESMOAS) summit in Lafayette, Louisiana. 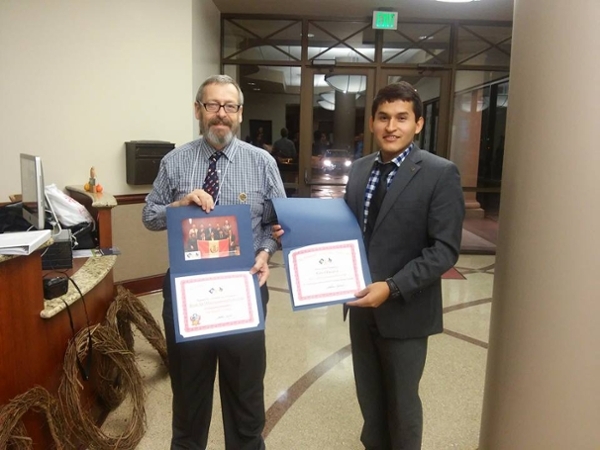 Carlos Alvarez, a graduate student of Criminal Justice, received the Distinguished Budgetary Statement (Secretariat for Administration and Finance) Award after presenting a mock resolution for the country of Perú in regards to its homeland security measures and policies to address poverty. Alvarez formed a team of nine TAMIU students who participated in the summit, held at the University of Louisiana. All members of Pi Sigma Alpha Political Science Honor Society, the TAMIU delegation included Alvarez, Javier Martínez, Samantha Rodríguez, Eduardo Solano, Joshua Llamas, Alberto Ayala, Celina Agredano, Melissa Facundo and Fernando Mendoza. The organization’s sponsor is Dr. James Norris, TAMIU professor of Political Science. ESMOAS is an academically-centered program with nearly two decades of history bringing the best and brightest college students together to debate issues facing the Western Hemisphere. It is a summit and competition using the same basic style as the Model United Nations, but simulating meetings of the organization of American States rather than the UN body. Before the annual conference, teams are randomly assigned a country within the Organization of American States. Team members present resolutions on pre-determined topics in various committees, all representing the interests of the country to which they were assigned. tic skills in the face of debate, contention, consensus-building and crisis. A first-timer to the summit this year, Alvarez said he was proud to bring the award and recognition home to TAMIU. Alvarez, a candidate for graduation with a master’s degree from TAMIU in December, said upon graduation he hopes to secure a job at the U.S. Department of State and in the future, will consider returning to TAMIU to pursue a doctoral degree. Other University competitors included students from the Universidad Autónoma de México, Universidad Regiomontana (México), St. Mary’s University, Baylor University, Angelo State University, University of Louisiana at Lafayette and Concordia University. For more information, please contact the Office of Public Relations, Marketing and Information Services at 326.2180, e-mail prmis@tamiu.edu or visit offices located in the Sue and Radcliffe Killam Library, room 269. Dr. Norris congratulates Carlos Alvarez on his performance at the ESMOAS Summit.